The iodine clock is a popular chemistry demonstration among high school teachers and science demonstrators. In this activity, two clear and colourless solutions are mixed together, which leads to no initial observable change. However, after a short period of time the mixture abruptly turns deep blue. This variation of the iodine clock reaction has the same dramatic colour change as the traditional demo! In addition to the dramatic colour change, this activity also serves to illustrate important concepts in reaction kinetics. The time it takes for the colour change to take place can be altered by varying the concentration and temperature of the solutions. A number of similar procedures can be found online, yet the overall reaction always consists of the same three steps: 1) In the first step, iodine is reduced to iodide, 2) iodide then gets oxidized back to iodine, and finally 3) the iodine reacts with the starch contained in the mixture to give the deep blue colour. The first step is faster than the second step, thus no change is observed until all the reducing agents in the solution are consumed and step 1 cannot occur anymore, allowing step 2 to proceed to step 3. While the reagents required for the iodine clock reaction can be easily found in a chemistry research lab, they are not necessarily the most user-friendly when it comes to doing this demonstration in a public setting. Typically, one solution containing sodium bisulfite, potassium iodide, and soluble starch and a second solution containing 20% hydrogen peroxide and concentrated sulfuric acid are employed in the demonstration. I began doing chemistry demonstrations at local high schools and quickly realized that this experiment would be challenging as it is not feasible for me to use some of these reagents; both 20% hydrogen peroxide and concentrated sulfuric acid are corrosive and must be treated before disposal. All the reagents needed for this modified procedure of the iodine clock demonstration. Luckily, I stumbled upon a very well written paper published in the Journal of Chemical Education where the authors managed to achieve the same demonstration using only consumer products. With the authors’ modifications, no concentrated acid or peroxide is needed. 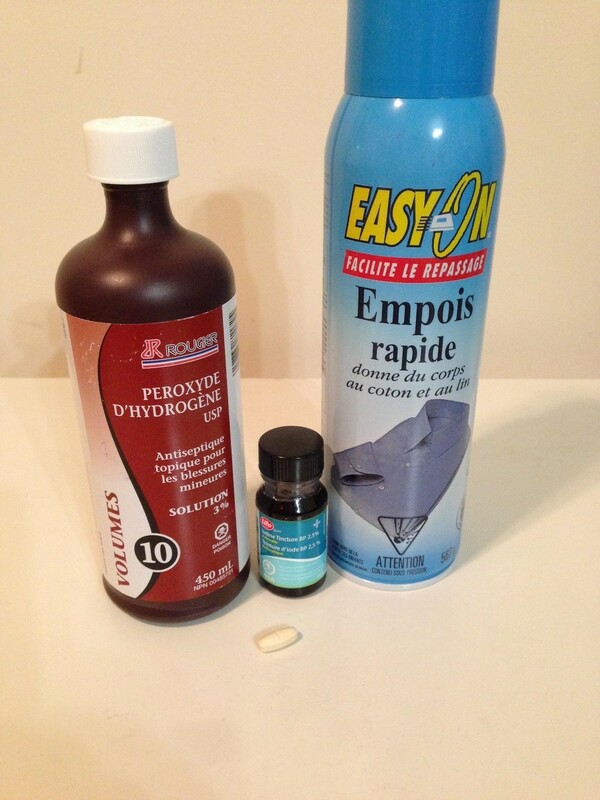 I was able to purchase all the required reagents at Shoppers Drug Mart and the demonstration can be safely repeated by students at home. The first solution in the new procedure is made up of vitamin C powder dissolved in water and a few drops of tincture of iodine, while the second contains 3% hydrogen peroxide and laundry starch. 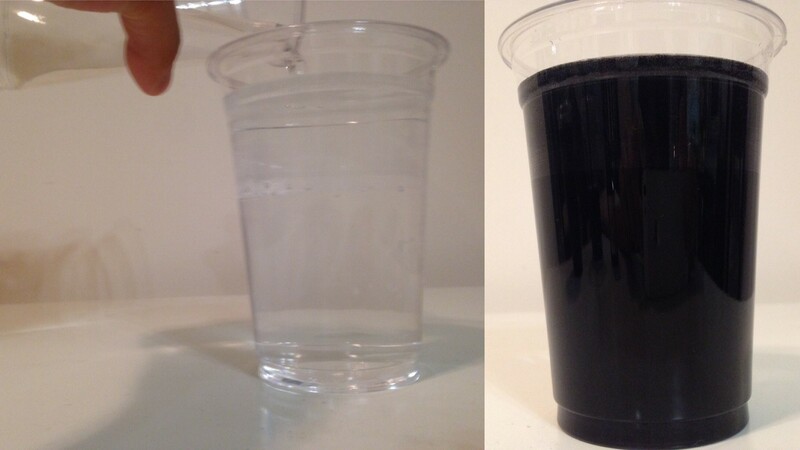 The same results are achieved – a dramatic colour change that gets students excited about chemistry. The difference now is that I could comfortably carry all the required chemicals on public transit and could rinse all of the waste from this demonstration safely down the sink. The transportation of reagents and the safe disposal of chemicals are often two of the biggest challenges facing chemistry demonstrators. Putting green chemistry principles into practice by eliminating the use of toxic chemicals and hazardous waste is an excellent way to help mitigate these challenges. Additionally, it helps students understand the importance of green chemistry at an early stage in their learning career. “The Vitamin C Clock Reaction”, S. W. Wright and P. Reedy, J. Chem. Ed. 2002, 79, p 41. This entry was posted in GCI Initiatives, Green Chemistry Education, Judy Tsao and tagged chemistry demo, green chemistry. Bookmark the permalink.